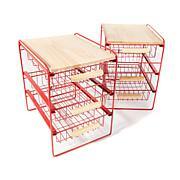 Create versatile, adaptable storage anywhere in your home with this handy six-shelf unit. 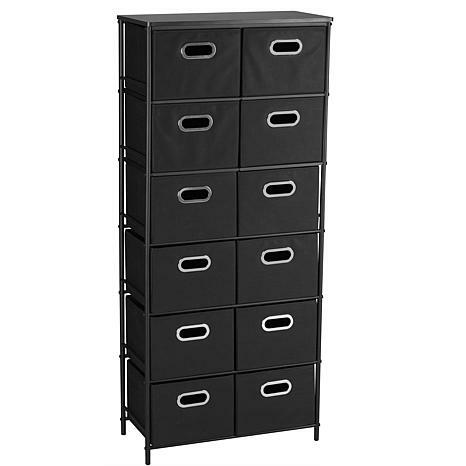 Its sleek, black metal frame hold 12 bins you can use to store craft supplies, laundry items, clothing or anything else that will help you stay organized. Looks better than in the picture ,very easy to put together !! Very well made ,exactly what I needed. 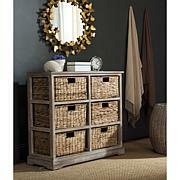 I love this storage unit. Very well made and easy to put together. I put mine in the bedroom and the solid top is great to put my lamp on.I think everyone should have one these. I just needed a little extra storage in our bedroom. This is perfect for some of my sweaters and less often used clothing. perfect size for my unused corner area. Fits the space to a "T". sturdy too! 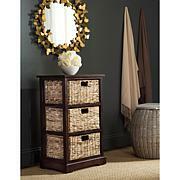 Good price as well, I did some comparison shopping before hand. I wish I had room for one more but I just don't have the space. I think I will get one for my daughters room next. Your office supplies, household tools and extra toiletries all need a place, but that doesn't mean you want to put them on display. 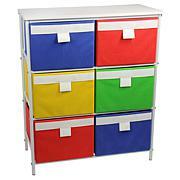 Stash your stuff easily with these durable fabric drawers that fit perfectly in your Everything Organizer. So you can keep your odds and ends in order and out of sight.